The formation of the country of Malaysia consists of unique and interesting structures made up by different elements such as the beaches, the mountains, and of course the land structures. Although Malaysia is currently a developing country, certain places in Malaysia – especially places with rich historical backgrounds and natural resources – are being retained and preserved by both the local people and the local government, as an effort of their loyalty towards their own origins. Sabah is one of the states in Malaysia which you will be able to find such original natural resources and historical landmarks that are being protected by the people and the government. If you are interested to witness these meaningful resources with your own eyes in Sabah, be sure to head on to Batu Tulug in Sandakan. Batu Tulug is one of the precious natural resources preserved by the local people and the local government in Sabah. It is a natural steep limestone cliff – formed naturally – and it is also one of the oldest limestone cliffs in Malaysia. Upon visiting, you will thus be able to see for yourself the uniqueness of the formation of limestone in the caves, which was shaped millions of years ago. This is a very precious sight to witness because of its historical background as well as the uniqueness of the formation ways it possesses. Besides, stepping into the Batu Tulug will also enrich your understanding related to the traditions practiced by the local people hundreds of years ago. Here, you will be able to see different coffins representing various animals. 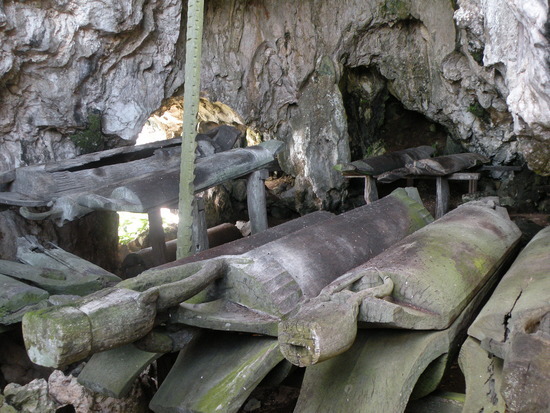 The most jaw-dropping part of these coffins presentations is that these coffins are all watched by the bats and the swallows in the cave, as if they are protecting the coffins in there. Apart from that, it is believed that the cave was once resided by the Orang Sungai and also the Chinese settlers hundred years ago. Thus, visiting the cave might be able to help you in discovering more of the cave’s secrets along with the meaningful historical stories embedded alongside the marks crafted in the cave. In the same time, you will also be able to catch sight of the site museum in the Batu Tulug, which will help you comprehend more of the histories the cave possesses as well as the unique traditions and cultures practiced by the local people who had once resided in the cave hundred years back. There are also resting huts and toilets for you to visit in case you are exhausted with the expedition.